KATHMANDU, March 24: Prime Minister Pushpa Kamal Dahal has ruled out the possibility of an immediate revision in the federal boundaries even as he expressed readiness to address other demands of the Madhes-based parties given that the latter agree to take part in the local level elections. Prime Minister Dahal said this during a meeting with other political parties including the agitating United Democratic Madhesi Front (UDMF), an alliance of seven tarai-centric parties, at his residence in Baluwatar on Thursday, hours before he left for China for a weeklong official visit. 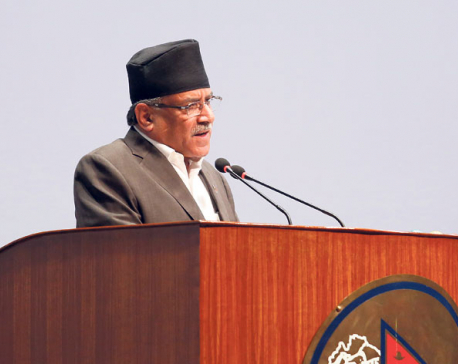 During the meeting, Dahal proposed to a drop clause pertaining to federal boundaries from the constitution amendment bill tabled in parliament and endorse the remaining parts. The bill constitutes four clauses pertaining to language, citizenship, representation in the upper house and federal boundary. Prime Minister Dahal also proposed to meet other concerns of Madhes-based parties including the one over demarcation of local boundaries. "All parties including the UML appear willing to support the amendment without the clause on federal boundaries. We are committed to revising federal boundaries before provincial elections if you support the local elections now," PM Dahal told Madhesi leaders, according to multiple leaders present in the meeting. He has also proposed to assign a constitutional commission to work out the details of demarcation. Though Dahal was hoping to strike an agreement before departing for China, it could not happen as the Madhesi leaders refused to accept his proposal. The prime minsiter's aides claimed that they are close to consensus and a formal agreement would take place following Dahal's China visit. Federal Socialist Forum Nepal Chairman Upendra Yadav, who had met Prime Minister Dahal separately on Thursday afternoon, told Republica that the stance of the Madhesi parties on local elections remains unchanged. He said constitution amendment before the elections is their 'bottom line' and precondition for participating in the elections. But some Madhesi leaders involved in negotiations with the major parties separately told Republica that there is a chance of consensus if the government agrees to their proposal to give the federal assemblies the powers to revise federal boundaries with certain majority in the future. "The constitution has closed the door on demarcation of boundaries in the future. That should be changed. The province should be given more power," said Rajendra Shrestha, co-chair of the Federal Socialist Forum Nepal. Before going to the polls, the regional parties have also demanded further increment in the number of local units in the tarai plains in proportion to the population of the regions. Tarai Madhes Loktantrik Party Chairman Mahantha Thakur earlier this week told Republica that more than half of the total local units should be in the tarai-Madhes, on the basis of population of the region.